Jennifer Anne Long, formerly of Massena, and Ian Phillip Squirrell were married on June 10, 2017 in Burlington, Vt. The bride is the daughter of Deborah Tricase Long and Timothy Michael Long of Massena. The groom is the son of Ellen Pritting and Suzanne Stewart of Underhill, Vt. and Trevor Squirrell and Linda Almy of Underhill Center, Vt. The wedding was in St. Joseph's Co-Cathedral in Burlington, Vt and was performed by Rev. Fr. 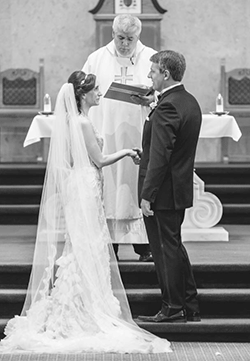 Kevin O'Brien of Heuvelton, a close family friend to traveled to perform the nuptial Mass. Lectors and readers were the bride's nieces Catherine Long, Danielle Long and Kelly Horan, the bride's sister Tracy Bird and the groom's mother Ellen Pritting. Church musicians included organist Celia Asbell, soloist Gail Whitehouse and a string quartet from the Vermont Symphony Orchestra. Matron of honor was the bride's sister, Tracy Bird. Other attendants were flower girl Vaera Squirrell, and bridesmaids Julie Chatteron (friend), Jess Purvis (friend), Lisa Long (sister-in-law), Melanie Squirrell and Sarah Squirrell-Piatek (groom's sisters). Best man was brother-in-law Chris Piatek. Groomsmen and ushers were Cade Goodspeed (bride's son), John Summa and Jordan Shea (groom's friends), Timothy P. Long and Zachary Long (bride's brothers). Kristopher Squirrell, brother of the groom, was near and dear to our hearts on this special day. Other attendants included Ari Schindler, the littlest friend of the bride. Charles Bird, brother-in-law of the bride, escorted his mother-in-law, Deborah Long, in memory of her late husband. Guests were treated to a reception cruise on the Spirit of Ethan Allen III, where they dined and danced into the sunset on beautiful Lake Champlain. The bride wore an art deco-inspired gown by Lazaro from Kleinfeld in New York with jeweled illusion back, plunging V-neckline, silk organza ruffled skirt and cathedral train and veil. In memory of her late father, she carried one of his golf clubs in her bouquet, a Wilson Staff 6-iron, cut down to fit perfectly among the flowers by her brother, Zach. The couple honeymooned in London, England. The bride is a certified registered nurse III and works at University of Vermont Medical Center, Burlington. She attended college at SUNY Potsdam and Vermont Technical College. The groom is a branch manager at People's United Bank in South Burlington. He attended Johnson State College. The couple resides together in South Burlington.